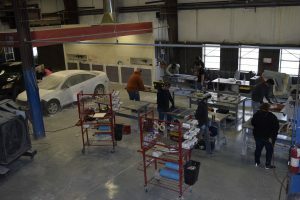 (WACO) – Texas State Technical College’s Auto Collision and Management Technology program will soon buy new equipment because of a recently awarded national grant. The program has received a $1,000 Ultimate Collision Education Makeover Grant from the Collision Repair Education Foundation. The announcement was made in late October at the 2018 Speciality Equipment Market Association Show in Las Vegas, Nevada. The money will be available in January. High school and college auto collision programs undergo a rigorous application process to be considered for the grants. Clint Campbell, TSTC’s statewide Auto Collision and Management Technology chair, said it took two months to complete the application, which includes information on the program’s budget and student job placement, as well as recommendations from industry representatives. Campbell said it is not only critical to the auto collision industry to teach students how to repair dents and paint, but also to use technology to reset collision avoidance systems being built for new vehicle models. Securing grants to purchase new equipment enables the program faculty to use money in areas where it is most needed. John McIntyre, 33, and Blake McIntyre, 28, both of San Angelo, are working toward Auto Collision Refinishing certificates and are scheduled to graduate next summer. The brothers chose to attend TSTC to learn techniques to use for a restoration shop they want to open in their hometown after graduation. They want to purchase older models of trucks, rehabilitate them and sell them at automotive auctions. “Automotives are a passion,” John McIntyre said. Blake McIntyre said he had an extra motivation for pursuing the certificate: He has been dissatisfied with past automotive paint jobs. He said his favorite class so far has been Automotive Plastic and Sheet Molded Compound Repair. TSTC in Waco has about 90 students pursuing the program’s associate degrees and certificates. This entry was posted in Waco on November 14, 2018 by Daniel Perry.